THE partnership between Our Lady of the Sacred Heart, Kavieng, Papua New Guinea, and Toowoomba Catholic Schools has focused on opening up the world to the staff and students through Information and Communications Technology. Four years ago two ICT technicians Nathan Hetherington and Yang Poh, from the Toowoomba Catholic Schools Office, visited Kavieng and rebuilt the school’s server, deployed donated computers and installed cabling to ensure that the school was networked. 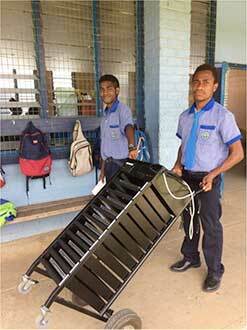 Late last year, two ICT technicians visited Kavieng to undertake a refresh of the server, retire old computers and set up PCs, laptops and other hardware that had become available through upgrading to Toowoomba’s infrastructure. The two technicians Brad Rohde and Yang Poh were proud and excited about what they achieved during their visit. “The school was so welcoming and we became a part of the community for the time we were there,” Mr Rodhe said. “It was really obvious the difference the partnership between us and the school has made. “To see the faces of the students when they were able to start-up the laptops or work in the computer lab was very exciting. “The work wasn’t easy though, with electricity and Internet connections being unstable compared to experiences in our schools. Helping ideas: Students from Our Lady of the Sacred Heart, Kavieng, Papua New Guinea, are benefitting from Toowoomba Catholic Schools Office technology. “Often we would be without an Internet connection to be able to complete various tasks, so we had to make do with what our OLSH counterparts consider ‘normal’. Since the Toowoomba men departed, not one day is spent at OLSH without the computers being used in lessons and by the teachers and administration team. As soon as the Year 4s are finished with the laptops as part of a Geography lesson, a Year 11 student is walking the laptops to the senior area of the school for a Biology lesson in a trolley that travelled via shipping container over 2000km to the school. “We are so very grateful to the Diocese of Toowoomba for their ongoing support,” OLSH principal Jo Martin said. “We also wish to thank New Britain Palm Oil and Fastair Services Pty Ltd who made it possible for us to transport the computers from Australia to Kavieng. “This work has truly opened up a whole new world to our staff and students. “Brad and Yang were also able to train and establish a relationship with our staff, so that we are now positioned to be able to do some upkeep ourselves. “And staff are comfortable contacting Brad and Yang for support which they so freely give – this is really important as it means the computers aren’t just band-aid assistance.